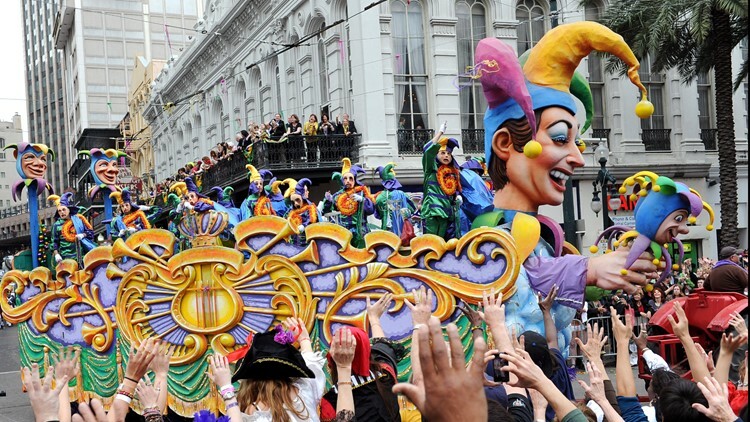 NEW ORLEANS — The Rex Organization and Kern Studios have decided to end their seven-decades-long partnership, the krewe and float-building company announced Tuesday. Although the Rex parade theme and floats originate with concepts created by Rex artistic director Henri Schindler and a committee of Rex officials, for more than 65 years the parade, the oldest daytime parade in New Orleans, has been built by artists and craftsman at Blaine Kern Artists and Kern Studios, the company founded by Blaine Kern Sr. in 1947 and now owned by his son, Barry. This year’s Rex parade, with the theme “Visions of the Sun,” will feature floats built and decorated by Kern Studios, but the 2020 Rex parade and processions for at least the next five years will be in the hands of a new builder, who the krewe says will be identified after Mardi Gras. A Facebook post by another local float builder, Royal Artists, Inc., said the company is proud to announce it will be the new Rex float builder. "We are pleased to be working for The King of Carnival 2020 and beyond. We are very excited about this once in a lifetime opportunity," the company wrote. Royal Artists, founded in 1975, designs and builds parades for the krewes of Proteus (Carnival’s oldest night parade), Chaos and Le Krewe d’Etat, as well as several parades in Mobile, Alabama. Rex officials would not confirm Royal Artists as the new float builder, saying only that an announcement would come after this year's Mardi Gras. No reason was given by either Rex or Kern Studios for the change, other than that it was a business decision, mutually agreed upon. "It's been such a wonderful relationship," Kern Studios CEO Barry Kern said Tuesday. "Of course it's bittersweet (to change), but we've had a wonderful history together. The decision was made mutually between both organizations. I'm humbled to have been able to serve and work with Rex all these years and there's so much respect between the two organizations." "We're extremely proud to for 68 years to have had the backing of Kern artists in creating what we think is one of the premier parades during N.O. carnival," said Rex Organization official James Reiss. "As all business relationships do, they mature. We're extremely proud that Kern has now taken New Orleans Carnival not just to other krewes but internationally to places like China, to Universal Studios. As they have grown, we think that we've been a big part of that growth. We're happy to see what they've done. It's just time for the two organizations to move on. It's really just an internal business decision. We're both very good friends and will remain so." Besides designing hundreds of floats carrying out individual themes for more than 67 years of Rex parades, Blaine Kern, his son and their team have also contributed to Carnival history by designing some of the krewe’s signature floats, including the Boeuf Gras and the King’s Jesters, as well as newer signature floats such as His Majesty’s Bandwagon, the Streetcar Named Desire and Butterfly King. While Kern did not create the King’s float, which is instantly recognizable around the world, his artists were responsible for tweaks made to it over the years, preserving its place in Carnival history. Rex Jesters float turns onto Canal Street. Photo by Cheryl Gerber/Getty Images. While its affiliation with Rex may be ending for now, Kern Studios will continue to build and design floats for Carnival’s largest super krewes including Endymion, Bacchus, Orpheus, Zulu and Muses, as well as Iris, the all-female krewe that is now the largest in all of Carnival in terms of membership. Kern Studios also rents floats to dozens of other parades in the region and across the country and builds floats and props for parades and corporate clients around the world. As a young man, Blaine Kern Sr., whose father Roy was also an artist, studied under noted painter John McCrady and at the New Orleans Academy of Art. He also apprenticed for float builders Soulie and Crassons, who built the Rex parade for many years in the 1930s, ’40s and ’50s. In the early 1950s they gave the young artist, who had made a name for himself as a sign painter, muralist and float builder for the Krewe of Alla, an opportunity to work on the Rex parade. “This was my big break,” Kern said in a 2017 WWL-TV interview. Before long, he had taken over the job completely. According to Rex historian Stephen Hales, Kern designed his first full Rex parade in 1952. Early in his tenure, Rex gave Kern an opportunity that he has said changed his life and pushed him, the Rex Organization and the city’s Carnival celebration as a whole in a new direction. The then-Rex captain, Darwin Fenner, personally financed trips for Kern to Europe to study the techniques of master float builders in Italy, Spain, France and Germany. 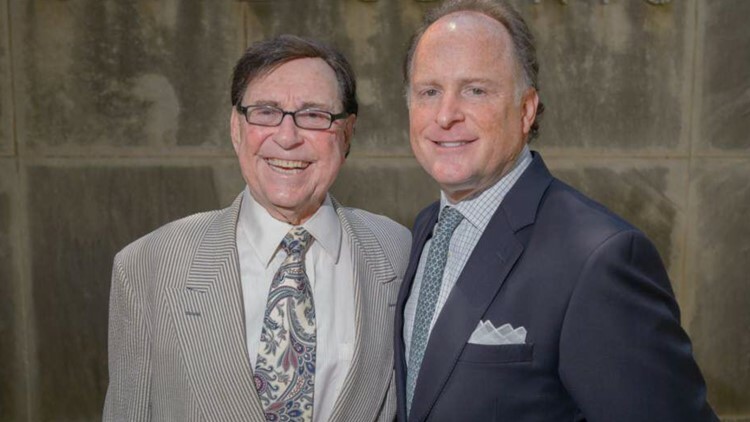 Blaine and Barry Kern in 2015. File photo by Matthew Hinton/New Orleans Advocate. Kern introduced many of the techniques he learned, particularly with vivid paint colors, large float figures and animation, to Carnival in New Orleans and Rex in particular. The large white Boeuf Gras figure, with smoke billowing from his nostrils and surrounded by a chef and Rex members dressed in white as butchers, remains a fixture in Rex parades to this day. Barry Kern, who is now president and CEO of Kern Studios, began working in the family float-building business as a young man, doing odd jobs around the warehouse and steering the company car in parades. He became president of Kern Studios in 1994, quadrupling revenue to $40 million and expanding the business with theme park attractions in Las Vegas, Europe, and Asia. A dispute with his father over control of the company was settled in 2015. Barry Kern’s son, Fitz, has joined the company as an executive as well. 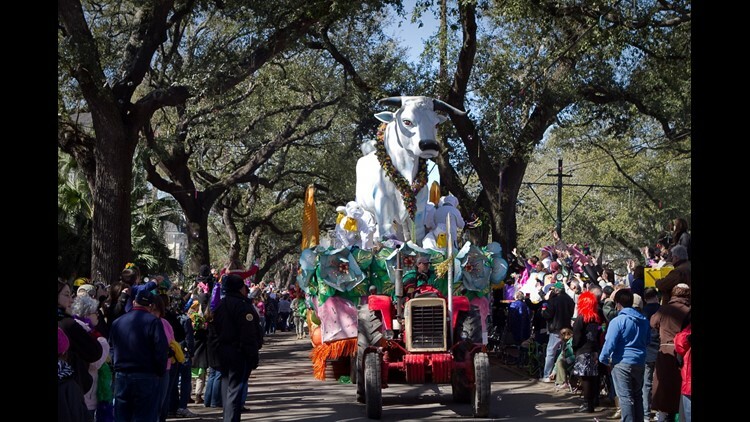 On Tuesday, Reiss wanted to assure the public that Rex's eight iconic signature floats, including the Boeuf Gras, King's float and Jesters float, will not change, no matter what float builder is responsible for them. Instead, the new float builder will focus on the 28 theme floats, the design and construction of which remains a point of pride for Rex. "The iconic floats of Rex will remain so," Reiss said. "You will not see anything dramatically different. We view these floats as rolling works of art and I don't think that's going to change." In recent years, Royal Artists has been hailed for achieving a traditional old-line look for its parades, some of which roll on wagon wheels that date to the 19th century. Rex will be a rarity in that it rolls in the sunlight rather than at night as most of Royal’s other krewes do. Some of Royal’s parades, including Chaos and d’Etat, have also won acclaim for their satirical and comedic themes, though as a more traditional krewe, Rex is unlikely to follow suit. Royal Artists owner Richard Valadie, a Louisiana native, has been with the company for more than 20 years and trained under the company’s founder, Herbert Jahncke Jr. Jahncke’s Royal Artists designed and built floats for several old-line Carnival krewes, including the three oldest night parades: Comus, Momus and Proteus. Comus and Momus no longer parade. Jahncke, who died in 2007, grew up steeped in Carnival tradition, with his father serving as Rex, King of Carnival, in 1966.